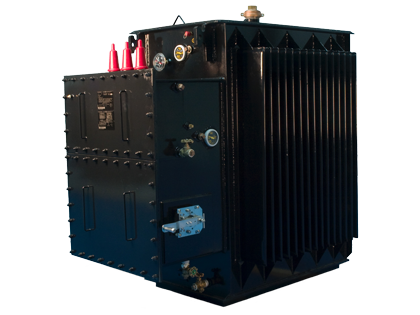 Howard Industries network transformers are designed and built according to the most exacting engineering standards to provide many years of outstanding performance and reliability in the most demanding utility network applications. Network transformers are typically used to supply power to grid-type secondary distribution systems in areas of high load density such as found in large cities and are designed for either vault-type or subway-type applications. Vault-type network transformers are designed for installation in above-ground dry vaults, where occasional submersion may occur. Subway-type network transformers are designed for installation in subsurface vaults, where frequent or continuous submerged operation is likely. Subway designs may also be used in vault-type applications. Product scope includes capacities from 300 kVA through 2,500 kVA with high-voltage ratings from 2.4 kV through 34.5 kV and low-voltage ratings through 600 Volts. Please contact the factory for availabiltiy of desired optional features not shown.